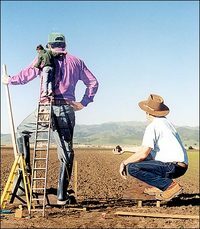 This quiet 51-year-old Californian (above, on a ladder) for the past 22 years has been creating giant plywood people who pop up in fields and on storefronts all over Monterey County, California. He doesn't care for galleries and art on walls, and winces when his pieces are called "works of art." Carol Pogash wrote a lyrical piece about this unique man for last Wednesday's New York Times: it follows. Out of the fertile fields of the Salinas Valley, the giant figures loom: 18-foot-high plywood workers harvest iceberg lettuce. An irrigator, his boot on a shovel, surveys the land. A farmer crouches nearby, his hand cupping the loamy soil. Women in headscarves thin just-budding crops. The creases in their shirts, their bodily expressions, even with their backs turned, these figures are so lifelike that their appearance startles passers-by, which is what their creator, the artist John Cerney, intends. The giant sculptures at the Farm, an agricultural education center and demonstration farm owned by the Crown Packing Company, are but one of dozens of installations in this valley, where the land looks much as it did when John Steinbeck wrote about it. 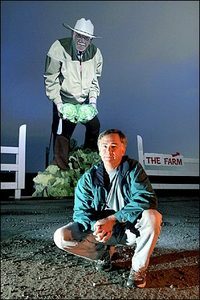 For 22 years, Mr. Cerney has been creating giant people who pop up in fields and on storefronts all over Monterey County, which includes the Salinas Valley and is about 100 miles south of San Francisco. The expanse of blue-on-blue sky and miles of row crops serve as his canvas. "I've never cared about galleries and square things framed on a wall," Mr. Cerney (below) said in an interview. What mattered "was that people would see my work," he said, adding "that meant working outside." Mr. Cerney, 51, lives a pared down life in a corner of his workshop in a corrugated metal warehouse here, where he works 12 hours a day pursuing his art. Parts of giant plywood people lie strewn about. Leaning against one wall, a marathon runner raises her triumphant fist in the air. A friendly gas station attendant grasps a hose, about to fill 'er up. Even in repose there is something both ordinary and heroic about his people. Mr. Cerney's art, said Amanda Holder, spokeswoman for the National Steinbeck Center in Salinas, "does what public art should do, it enriches the landscape visually and emotionally." He hesitated initially because he prefers his work to be displayed outdoors. His field art, flowering in the salad bowl of America, "draws attention to the value of farmworkers," said Dr. Amalia Mesa-Bains, chairwoman of the visual and public arts department at California State University, Monterey Bay. But, she said, because the farmer who commissioned the work "is positive and fair with his workers," Mr. Cerney's people fail to say anything about "poor working conditions, illnesses from pesticides and bad housing." She added, "That is a whole other story that's never told." Mr. Cerney "brings back the tradition of regional art, roadside art," and Works Progress Administration murals from the 1930's that survive in schools and post offices around the country, said his friend, the artist D. J. Hall. When Beverley Meamber, president and chief executive of the Salinas Valley Chamber of Commerce, called his pieces "works of art," Mr. Cerney, a marathon runner who looks younger than his years, winced, preferring to think of himself as a draftsman and illustrator. He likes digging four-foot holes and pouring the concrete for the Douglas fir posts that, along with a metal bar, hold the plywood people in place. His work combines two parts of his life: agriculture and art. After high school, he spent seven years working for a produce company, operating a forklift, until he quit to enter college. After graduating from California State University, Long Beach, with a degree in art, he returned home to Salinas, where he knocked on a stranger's door and persuaded him to hand over the front of his building. Mr. Cerney converted an ordinary facade into a stunningly realistic mural of "Tony's Friendly Auto Service." His only payment was $50, for putting friends' licenses on the painted cars. Since then, "Tony's" has given way to "Sam's Friendly Produce Stand," a mural on the same site with cut-out plywood characters and a truck loaded with produce boxes that is so realistic that the Chamber of Commerce has had to disabuse tourists who, having seen the picture in agricultural magazines, come to shop at Sam's. Mr. Cerney started making his plywood people pretty much by accident. While painting the produce stand, he "miscalculated" the space available and had to add a plywood arm to one of his painted people. He noticed how the arm "popped out," liked the effect, and added a plywood Corvette and a free-standing girl. A dozen plywood people followed. "I don't need walls anymore," he remembers thinking. Chris Bunn, who owns Crown Packing, wanted to pay tribute to his workers. He and Mr. Cerney agreed that life-size characters would be too puny for motorists to appreciate. The giant people were born. Other works highlight Mr. Cerney's humor. In 1993 he approached Ed Gularte, the owner of Abbott Street Auto Body at a major intersection here, and told him he wanted to create an accident scene. Agreeing to the idea, Mr. Gularte said, was the best marketing move he ever made. For the body shop Mr. Cerney created a 10-foot-tall plywood tie-dyed hippie in a neck brace standing in front of his smashed Volkswagen bug, whose luggage rack holds a guitar case with a Grateful Dead sticker. An eager attorney thrusts a paper at him that reads: "Frivolous lawsuit. Sign here." Across the way, a woman in a leopard-skin coat has leaped from her dented Mercedes and points accusingly at the hippie. A Salinas cop scans the scene with an expression that says, "Lady, I've heard it all before." In the center stands Mr. Gularte with a self-satisfied look. His foot rests on a box with a Mercedes logo and the words "Costly Auto Parts." Not everyone has always looked favorably on Mr. Cerney's work. After his accident-scene art was installed, the City of Salinas told Mr. Gularte he didn't have a permit and had 10 days to pull it down. He said that he told them they would have to take him to court. The Chamber of Commerce intervened, and the city never followed through with its permit requirement. For each of his pieces, Mr. Cerney poses real people, photographs them and then paints their images on plywood. A partner, Dong Sun Kim, assists him. Over the years Mr. Cerney has been clever about his financial survival. In 1992 he created a baseball scene on the side of a barn facing Highway 101. To help defray costs, he charged friends $100 each to have their faces incorporated into the mural. For the "Sam's Friendly Produce Stand" mural, produce companies initially paid $25 to have their logo painted on a box of produce. Since then, prices have risen to $1,000 a piece, with companies vying to have their box on top. As an artist whose work is largely shown outdoors, Mr. Cerney faces environmental challenges. Termites recently nibbled his baseball scene. While restoring it, he had to dodge charging calves. In another field, where he had constructed a plywood scene of a farmer painting black spots on a white cow, real cows rubbed off the painted cow's spots. His work has been installed in other Western states and the Midwest. One of his most eye-popping installations is in a field in Arizona: a gigantic baby scrunches over a tiny tractor while the mother looks on in amazement. Now, inspired by a recent visit to Mount Rushmore, Mr. Cerney is negotiating with Monterey County landowners for use of a hillside where he can make something even larger than the presidential heads. He wants to construct the image of an old woman, a Mother Earth figure, peering down at all the little people passing by. "She will lead me to the next step," Mr. Cerney said. "I don't know what it will be." I love these as I traveled up 101. I am curious about the older woman up on a hill I believe, is near Salinas....this looks to be like some sort of memorial to her and her land. Could someone help me out with this? I was delighted to find information on the wonderful characters we passed while visiting Monteray. I love them and hope the "rectangle billboards" will take a clue from them. They do not clutter our landscape - they add to it! I'm so glad I found information on these! My friend and I recently got back from a roadtrip to California (from little, woodsy Pennsylvania) and were intrigued by these cut-outs by our hotel in Salinas. I didn't think I'd find anything on them, and was glad to see this write up! Now I no longer need to be so curious about these giant workers. Thank you!